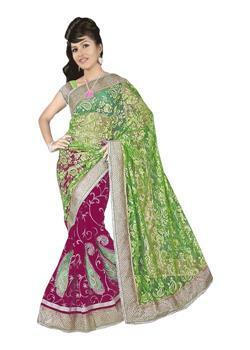 Purplish-blue and lime green nylon georgette & jacquard saree that adds more charm in your beauty. It is having jacquard pleats enhanced with rich golden embroidery and thread work with attractive border. 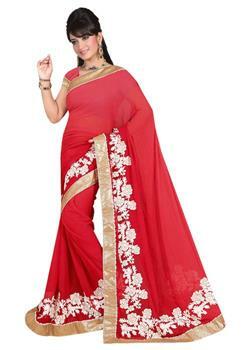 Also the pallu of the saree is having contrast orange border with floral embroidery work. It comes with attached unstitched blouse fabric.